UVic promotes teaching that reflects the aspirations and calls to action of the Truth and Reconciliation Commission, including addressing issues most relevant to Indigenous people and working with Indigenous communities and organizations to understand, preserve and celebrate traditions, knowledge and cultures. A former UVic School of Music student, Newman will be the first Audain professor to hold a new three-year position with the department. He will also play a role in the award-winning ACE program with UVic’s Gustavson School of Business, which supports the entrepreneurial practices of Indigenous artists. 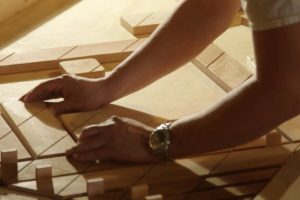 The artist in his studio in 2013/14, working on one of the cedar panels for the Witness Blanket. Photo: Media One. The master carver for the Cowichan 2008 Spirit Pole, Newman had another piece, “Dancing Wind,” featured at the 2010 Olympic Games. For over 20 years, he owned Sooke’s recently closed Blue Raven Gallery. He is also an accomplished pianist and singer who has performed at the National Aboriginal Achievement Awards and with Pacific Opera Victoria, where he is currently a board member. Best known for his 12-metre-long Witness Blanket—created and assembled from 600 objects and artifacts including pieces of residential schools, an old drum and a shoe—Newman spent four years travelling across Canada with the installation that evokes the atrocities of Indian residential schools and a national journey toward reconciliation. Newman is excited to bring ideas of reconciliation into his classes at UVic. 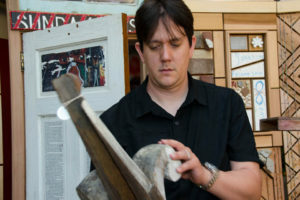 Established by a $2-million gift from philanthropist and UVic alumnus Michael Audain in 2010, the position has brought distinguished practicing artists Rande Cook, Nicholas Galanin, Michael Nicol Yahgulanaas, Jackson 2Bears, and Governor General’s Award-winner Rebecca Belmore to teach in the visual arts department.